[by Dean Smith] The large Hadron Collider, located in Cern, just outside Geneva Switzerland, is 27 kms (15 miles long) and buried 100 meters underground. The machine which has been idle for two years for renovation and repair was just turned on June 2, 2015 with increased capacity. Also called a particle smasher, it now has the potential to send proton beams around its circular track with the force of 13 trillion electron volts (TEV) up from 8 (TEV) two years back. They plan to have it running at maximum power by summer or early fall. 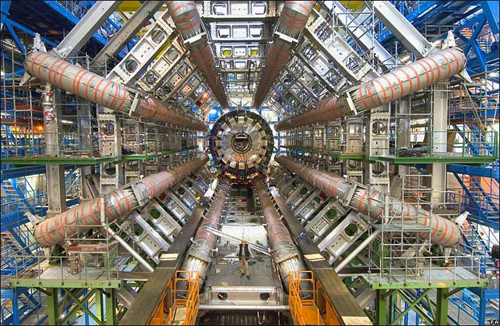 It is hoped the Collider will answer many questions about physics. Using super magnets, it sends proton beams containing billions of particles around its track at close to the speed of light with the goal of having them collide with each other. Only a handful of particles in the beams would crash together. When that happens, the physicists believe it will create the mini-energy equivalent of what took place shortly after the Big Bang. Some also believe these collisions from the new improved Collider could create mini black holes. Should that occur, it will give credence to theories there are different dimensions or parallel universes existing alongside ours. Yes we are talking serious Star Trek. Some think these black holes, which would disappear after a few seconds, would leak gravity from the other dimensions proving their existence. But that is not even the bizarre part. Not only could gravity leak through, but other things, maybe even other beings, might come through as well. Sergio Bertolucci is director of Research and Scientific Computing for European Organization for Nuclear Research the group that oversees the Collider. This is certainly stuff of science fiction and who knows if this possible or even a concern. This is nothing new for Christians, we believe in the existence of another spiritual dimension. One of the clearest passages revealing this involves the prophet Elisha. In 2 Kings 6, we read the account of how the King of Aram was increasingly frustrated in his failed attacks against the King of Israel. The advisers of the Aram king said the prophet Elisha was spilling the beans on Aram’s plans allowing the Israeli king to counter any attacks. The Aram king decided the only solution was to take out Elisha. After finding out about Elisha’s home near Dotham, the Aram king dispatched a strike force to capture or at the very least kill Israel’s prophet. During the night, the invaders quietly surrounded Elisha’s home and when the prophet’s servant awoke he saw the gathering army. Terrified, he awoke Elisha. “Do not fear, for those who are with us are more than those with them. It was a realm that Elisha was already aware of and after that prayer, God opened his servant’s eyes. This verse reveals a spiritual realm unseen to human eyes. It is inhabited by Godly angels and satanic as well. We see a reference to the demonic when Elisha says there are more with us than with them, implying Aram had unseen resources as well. But this isn’t even the strange verse I was referring to. To find that verse, we need to go to the Book of Revelation, which involves a vision of the end-times vision the Apostle John had while on the island of Patmos. Starting in Revelation 8, John reports on seven judgements that would occur when angels sound trumpets. It is the fifth trumpet (Revelation 9:1-12) that catches our attention. This passage describes a personified star hitting the earth and opening a “bottomless pit” also called the abyss. After that happens, John saw a myriad of beings pouring out. They were given the power to torment any who did not have the seal of God on their forehead. They were not allowed to damage nature or kill humans, just to torment. We are not given the specifics of how this happened other than a star that had fallen to earth was given a key to unlock a bottomless pit. Certainly we have no evidence to suggest this Biblical event is connected with the experiments going on at Cern, other than asking could the Hadron Collider fit the description of a key? The explanation of the word science in the English dictionary is very lucit. 1 Systematic knowledge of the physical or material world gained through observation and experimentation. Science today attributes ~the presence of man and the absence of God~ to a cosmic event that it claims was accidental that was given the name “big bang”. The way as to HOW matter appeared from nowhere (a void) does not concern science. Explaining the way as to HOW mater starts “on its own” to form planets and planetary systems that were to support intelligent life does not concern science neither. The physical events that took place right after the “big bang” can come under the study of science because they are material events (physical phenomena) of a material world that can be studied through man’s reason and logic. However the events that preceded the “big bang’ cannot be studied by the logic of man (science) because there is no physical or material evidence that can substantiate them. There for the events that preceded the “big bang” cannot possibly examined by science. Science will tell you it does not matter what showed up first the chicken or the egg. Theology however will tell you there is a creator God …and that it was the chicken! Any mater that suddenly appears from nowhere (a void) with a “build in plan” to form planets and planetary systems that will eventually sustain life cannot come into to being without “a Preplanning Mind” that ordained it so. This (the Preplanning Mind) is what everybody knows or describes as God. There is no mater known to man (science) that can appear from nowhere (a void) on its own and then start to form millions of planetary systems and galaxies that can sustain life unless it was Created to do just that. This is why God (the Preplanning Mind) is also called a Creator. Scientists reject the idea of a God because they cannot comprehend (know Him) with their logic. They have been “trained” to understand that anything beyond their material way of understanding things (science) is incomprehensible and not accepted… therefor rejected! However there are those people in the world who know God personally (His Saints) who will tell you through their personal experiences that God is a PERSON because He is known to talk to people ~person to PERSON~ like He did when talking to Moses. There is a simple fact (rule) about God making His self-known to men and women that is ignored by science and generally the rest of the world today and this is the fact that God reveals His Self…ONLY TO THOSE THAT HE WANTS TO ! After Pentecost and the descending of the Holy Spirit, the Apostles created Churches around the world using specific rules (given from above) that are known as the 85 Holy Apostolic Cannons. The Church was created as a therapeutic institution in order for God to be able to reveal His self not in the mind of man (logic) but in the soul (heart). The heart is the place inside were God testifies to His Self, it the faculty of intuiting that gives man the axioms upon which to reason. [2 Corinthians: 4:6]. “God makes His Light shine in our hearts, to bring us the knowledge of God’s glory shining in the face of Christ. There for the time ~before the big bang~ rightfully belongs to Theology. Science does not have the “knowledge or the tools, the eyes of the heart” by which to see and know Creator God Personally who reveals to those becoming worthy all knowledge including knowledge on creation, so they are “condemned” to the type speculation that is born from fantasy which becomes their accepted “illogical logic” that will disallow their minds/hearts while alive to seek or/and know God personally! The revelation from his Saints that the all mighty Word of the Legislature God and His creational Command was set forth ONE TIME for ALL TIMES from the beginning of Creation till the doom of this world is infallible being that the experience of the Saints during conduct with Divine Light (God) is the very foundation of Orthodox theology. The question remaining now is this. Does science want to know all of the events that took place before the big bang? The answer is already known and it is very simple to understand how it was begotten provided a person believes that there is a God who created it all who was responsible to deliver the Holy Bible to the world in order to get to know Him! All of the events of Genesis and the Old Testament took place before the “big bang” (the exile of Adam from Paradise) were dictated to Moses by an angel!